Bottom line: Alibaba’s purchase of Ele.me and Tencent-backed Meituan’s purchase of Mobike underscore the growing rivalry between Alibaba and Tencent, as each uses its deep pockets to try and dominate money-losing emerging sectors. Trade wars are making all the big headlines these days in US-China news, forcing a couple of mega-mergers that would normally be front-page news into the back pages. Each of the latest deals is quite significant for China’s Internet, as both quietly underscore the increasingly intense rivalry between titans Alibaba (NYSE: BABA) and Tencent (HKEx: 700). The larger of the deals has Alibaba forking out more than $5 billion to buy the remaining stake of Ele.me it doesn’t already own, adding important fire power to the leading takeout dining service whose chief rival is Meituan-Dianping. In a separate but also quite large deal, Meituan, which counts Tencent as one of its largest backers, has acquired leading shared bike operator Mobike in a deal that values the latter at about $2.7 billion. The common theme to both deals is that new Internet-related sectors like shared bikes and takeout dining often become cash-burning black holes as new players jockey for market share by offering highly subsidized services. That was certainly the case with takeout dining and shared bikes, which have collectively consumed billions of dollars in investor cash in very order for both sectors. The problems begin when investors tire of losing those billions of dollars with no apparent end in sight, which is what was happening in both of these spaces. But such concerns are less of an issue for both Alibaba and Tencent, which have become two of the world’s most valuable companies and have mountains of cash and access to even more from lenders and other funding sources. That reality has effectively driven many of the top players from massively money-losing emerging sectors into the hands of Alibaba and Tencent, who are more than happy to subsidize such companies until they can find a way to profitability. That appears to be what’s happening at some level with each of these two new mega-deals. 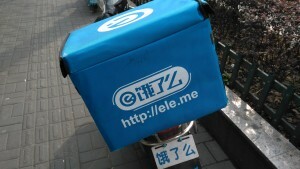 Let’s start with the Alibaba-Ele.me deal, which was first reported a few weeks ago as talks were ongoing. Those talks apparently bore fruit, and the two sides have announced that Alibaba will buy the remaining stake of Ele.me that it doesn’t already own, in a deal that values the takeout dining company at about $9.5 billion. (English article) Since Alibaba already owns 43 percent of Ele.me, we can calculate that the remaining 57 percent would cost it about $5.4 billion. China’s internet-based takeout dining platforms were previously dominated by Ele.me, Meituan and online search leader Baidu (Nasdaq: BIDU), until Ele.me and Baidu merged last year. Ele.me probably had to fork over at least some cash as part of that deal, and its own operations are believed to be losing massive money as well. That unsustainable situation, combined with the fact that few outside investors wanted to give it more money, effectively drove the company into Alibaba’s hands. With such a deep-pocketed owner now standing firmly behind it, Ele.me can probably breathe easy for at least the next few years. Meituan’s situation is slightly different, since the company remains independent and thus can’t really count on Tencent for unlimited new funds. But Meituan also earns money from its more profitable restaurant ratings and group buying services, and can probably use those to subsidize its takeout dining service for at least another year or two before investors start to get impatient. There’s not much detail in the reports of this purchase, except to say that the deal values Mobike at $2.7 billion. One of the reports notes the deal was brokered by Pony Ma, founder of Tencent, which is a big backer of both Mobike and Meituan-Dianping. This particular deal also comes as Meituan-Dianping is reportedly eyeing an IPO as soon as later this year. This latest twist comes just weeks after Ofo secured its latest funding, around $866 million, in a round led by Alibaba, once again showing how Alibaba and Tencent are pulling all the levers behind the scenes. At the end of the day, I’m quite skeptical that the shared bike business has a sustainable business model, though perhaps takeout dining can accommodate one major player. But with Alibaba and Tencent now clearly each support the last remaining players in both spaces, we can probably expect the takeout dining and shared bike wars to last for at least a couple more years.